Sol Hess was born in Philadelphia, USA in 1886 and died on January 30, 1953. As a young man he attended the Pennsylvania Museum School of Industrial Design and began working for Lanston Monotype in 1902. 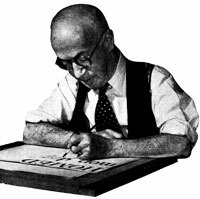 In 1922 he became the Typographic Manager. He has worked there with the Monotype Art Director Frederic Goudy and then took over that position in 1940.